As we move into the winter and toward the end of the tax year, we again invite all of our members to contribute to EarthSpirit’s annual fund to support the work it does all year round. This year EarthSpirit turned 40 years old! For four decades, EarthSpirit has sustained and nourished a community that supports families and individuals in truly living their spirituality, maintaining and passing along pagan cultures and traditions in a world that does not always share our values. Generous donors, like you, enable us to offer the rituals, classes and gatherings that create meeting places where we can build and deepen meaningful face-to-face connections, network with spiritual people around the world and also provide some financial support to community members who are ill or struggling. This year has seen some exciting developments. We have a beautiful new website, our first full reconstruction in 20 years! If you have not visited it yet, please travel over to www.earthspirit.com and see what our excellent designer, Moira Ashleigh, of SolsticeSun Design, has created. At Glenwood, we have also just activated our big new solar panel array which will power our offices and Community Center as well as some of the residences there. We are thrilled to be moving toward a lower impact energy footprint. EarthSpirit’s Board of Directors expanded this year with the addition of three new members and the retirement of one. Board members now include: Andras Corban Arthen, Deirdre Pulgram Arthen, Kaye Hughes Kittredge, Moira Ashleigh, Susan Curewitz Arthen, Sarah Rosehill, Eric Leventhal Arthen, Kate Greenough Richardson and Donovan Arthen. Leona Stonebridge Arthen retired with our thanks for her many years of dedication. The year has also brought challenges, of course. The political climate remains tense, hate crimes are on the upswing, and we continue to see intolerance and prejudice step boldly into the light as the US moves away from environmental responsibility and closer to war. The most vulnerable among us, those in poverty or in minority groups, are endangered and many EarthSpirit members feel personally afraid. The need for clear information and communication, mutual support, and outreach to the diverse world around us has never been more pressing. EarthSpirit is doing what it can to provide leadership and an anchor in this time of upheaval – offering encouragement to its members and taking action when we can in places where it is needed. This year we organized delegations to participate in the Washington DC Climate March and the Boston protest against the white-supremacist “free-speech” demonstration. Many of us have represented EarthSpirit at community meetings and spoken or sung at other public events resisting the current wave of climate change denial and neo-fascist aggression. The interfaith work that EarthSpirit has been committed to for so many years offers us many valuable connections. Our spiritual director, Andras Corban Arthen, continues to serve as Vice-chair of the Board for the Parliament of the World’s Religions. EarthSpirit and its members are well-known to many in that organization and they are supportive of us. In this capacity Andras will be an invited speaker at the UN this January, at a symposium on the Role of Religion and Faith-based Organizations in International Affairs. Andras was again elected President of the European Congress of Ethnic Religions and his leadership there connects us directly with people still practicing the old indigenous ways in Europe. Our Earthways Initiative reaches out specifically to Indigenous people in the US as well as in other parts of the world. We will continue to join forces with all of these peoples and groups to further our work to protect the Earth and support spiritual communities devoted to it. Looking to the year ahead, we have already registered a 30-person delegation to attend the 2018 Parliament of the World’s Religions in Toronto to represent EarthSpirit and its members, staff an informational and networking booth, and offer a range of programs. Deirdre Pulgram Arthen, EarthSpirit’s Executive Director, is serving on the Women’s Task Force this year, working specifically on coordinating programming involving the arts, ritual and the divine feminine. Andras continues his active work on the Indigenous Task Force and on the Executive Committee of the Board. In order to support those who will travel to Toronto with at least partial subsidies, to fund the booth and to cover costs of printing and product production, we need to raise $25,000 or more – in addition to our usual operating expenses. It is a tall order in one year, but we are optimistic. As these things move forward, EarthSpirit continues its day-to-day services. In the US this year, we again hosted more than a dozen seasonal rituals in both eastern and western Massachusetts. 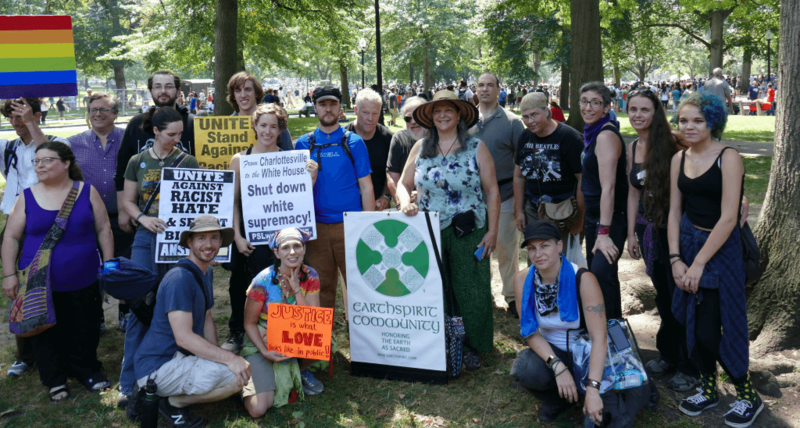 We reached out to the public at Boston Pride, at academic institutes, Pagan Pride events, environmental actions and at other festivals and interfaith services. We performed handfastings, baby blessings and funerals, counseled members in need, and supported those facing medical and emotional crises. We made improvements to the ritual spaces at Glenwood, our center and sanctuary in western Massachusetts, which we open to the community as part of the Sacred Land program on a monthly basis. We continued working to develop a long-range strategic plan for the organization, and made strides toward improving our infrastructure. All of this work in so many areas requires a significant amount of funding to sustain it. Outreach and activist efforts which include travel, like participation at recent climate, women’s and anti-racist demonstrations, can add expense. Right now you may be overwhelmed with the many choices of worthy causes to which you can donate money. We hope that you will recognize EarthSpirit as an organization that serves you and those you care about – whether you know them personally or not – as well as one that steps up and acts when that is needed. Our community has always been generous. We have consistently received contributions large and small which allow us to carry on. We appreciate every single one, as well as all of the volunteer time and expertise that our members contribute throughout the year. We are asking you to please consider increasing your financial donation to EarthSpirit this year to support our work to address the current challenges, attend the Parliament of the World’s Religions in 2018, and to continue to move forward with our ongoing projects. We count on all of you to be a part of the web that holds us together on so many levels. We wish you all a prosperous and healthy year ahead. Thank you all for being part of and supporting the EarthSpirit Community! or by visiting our website: www.earthspirit.com .